opticalCON Fiber Optic Connection System | PRO MUSIC, s.r.o. Assembled extra rugged hybrid cable with 2 multi-mode fibers and 4×0.75 mm2 copper conductors, GFK strength member and aramid yarn as cable retention. Low weight robust hybrid cable, only 78kg/km. Pre-assembled SMPTE cable with 2 single-mode fibers (PC or APC), 4 copper pins, overall copperbraided shield and stainless steel strength member, strong black PUR outer jacket for abrasion resistance. 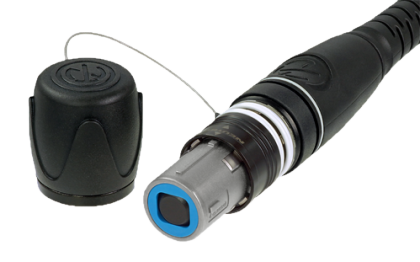 The opticalCON system is based on LC connectors but eliminates its weakness and guarantees a safe, dust protected and rugged connection. The opticalCON QUAD is based on the proven opticalCON DUO connection system but with four channels it is optimized for Point-to-Point interconnections and multi-channel routing applications. The system copes with the increasing need for fiber optic channels. The opticalCON QUAD cable connector accommodates four PC optical channels based on conventional and proven LC connectivity protected by a ruggedized and durable all-metal housing. It features a spring loaded push-pull locking mechanism and an excellent cable retention utilizing aramid yarn. The optical connection is exceptional well protected against dirt and dust by an automatically operated sealing cover. The cable connector comes pre-assembled and is not available as a single component. The cable is available in different lengths and is packed either in a case, on drum or airspool. Assembled, 4-channel X-TREME cable, cut-proof and rodent resistant double jacket glass yarn armored cable construction, excellent cable retention due to aramid yarn, black PUR outer jacket. The chassis connector acts as a „feed-through“ allowing simplified installations by connecting four conventional LCs on the rear. It is built in the standard D size shell and features an automatic sealing cover for maximum dust and dirt protection and a Push-Pull locking mechanism for safe connection. Colored sealings are included to identify the fiber mode. opticalCON MTP® Assembled, rugged and lightweight 12-channel mobile field cable, excellent cable retention due to aramid yarn, black PUR outer jacket, available in single (APC) and multi mode (PC). Hybrid (240V AC / 16 A) multichannel cable solution (up to 8-channels) based on the opticalCON QUAD and powerCON TRUE1, optimized for ENG/SNG applications, excellent cable retention due to aramid yarn, black PUR outer jacket. opticalCON LITE is a semi-rugged fiber optic connection for a wide variety of applications: its lightweight, compact design, robust housing, and high mating cycles provide a safe and cost-effective connection. Employing a novel fiber structure, the cable used with opticalCON LITE is designed to meet the extreme conditions of the entertainment industry. The cable offers excellent bending performance, a compact design and extreme flexibility that far exceed the mechanical strength of conventional patch cables. 12 channel MTP® based fiber system, improved bending performance due to new tactical fiber design, black matt outer jacket, available in multi- and single-mode (PC or APC). With simultaneous monitoring of attenuation for up to 4 transmission channels, powerMONITOR provides an immediate, „on air“ view into fiber optic signal strength. Visual and audible alarms can be set individually for each fiber channel, based on each channel's power budget. powerMONITOR provides clear status information, delivers early warnings for potential problems, and assists with maintenance scheduling. Due to space saving design the opticalCON panels are the ideal solution for cramped rack applications as for example OB truck I/O panels. Further the mated cables have best cable bend protection due to 45° angled outlet position.